Villa Delona is located in the fertile Eggares Valley. The location is very quiet, in a fertile plain between the village of Engares and the gulf of Amiti. Engares is a village having preserved its original character. Tourism has barely touched this place, which is located at a distance of approx. 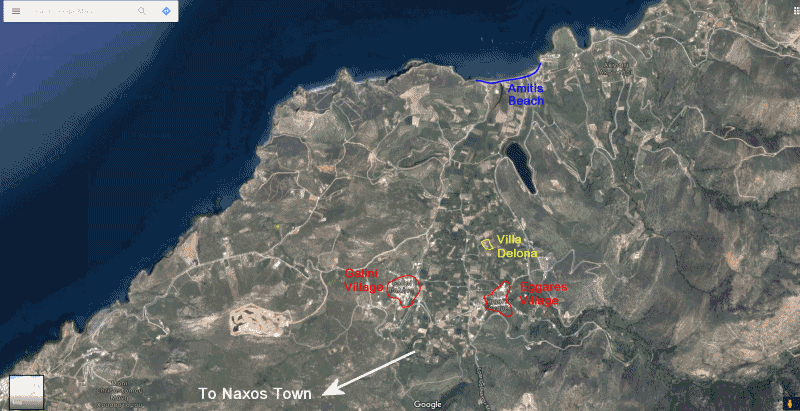 7.5km to the north of Naxos Town, in a green, fertile plain. In the village there are some taverns and a mini market, good shopping possibilities and many taverns exist in the city of Naxos, at a distance of 7.5km. Several hundred meters long, the sandy beach of Amiti is natural, without any infrastructure - no sunbeds and umbrellas for rent! The distance to the village is approx. 300m and to the beach 800m (a walking through the valley).